Rising temperatures and aquatic invasives affecting global fisheries | What's with the Climate? The following piece was sent to us by Pucci Foods, a seafood company. Rising ocean temperatures have begun to affect our oceans in many ways, some we are just beginning to comprehend. Rising carbon dioxide in the atmosphere is further compounding the stress on the diverse ecosystems in the oceans by increasing the pH levels of the waters. All of this affects our global fisheries. While fisheries have been squeezed by unsustainable fishing practices of many companies, some have begun to implement healthy fisheries management practices. Indeed the climate movement could use the support of this industry. Having the companies communicate about how climate change affects their industry is critical. While this entry is not an official endorsement of any company, we urge readers to take note of this important issue. The original piece can be found here. There are three little words that strike dread in the heart of anyone who relies on the natural resources of our oceans: aquatic invasive species. Life in our oceans has evolved over millions of years to build the beautiful ecosystems we see today. Each creature is well-suited for their watery niche – if they they don’t adapt they die. Each animal and plant has adapted to live in a very specific environment. Each one is adapted to a unique set of prey, predators, and environmental conditions, such as temperature and salinity. When removed from their habitat and placed in a new one, they either thrive or expire. Unfortunately for many marine ecosystems, aquatic invasive species have taken hold and infringed upon native habitat. Invasive green crabs, aided by warming ocean temperatures, are wreaking habitat and economic destruction on the East Coast. Aquatic invasive species are a growing problem. With the fleets of ships and shipments traveling from one country to another, there are endless ways for little critters to hitch a ride. A common mode of transport is the ballast water of a ship, as it is sucked up in one port and expelled in another, releasing any number of invasive larval invertebrates and fish. Their spread is unpredictable and some of our environmental conditions are able to keep them at bay. However, we are now learning some disturbing news: the spread of some aquatic invasive species may be facilitated by warming ocean temperatures associated with climate change. When aquatic invasive species manage to enter a new ecosystem, they don’t have the same predators that have evolved along with them. If they can survive the environmental conditions, then they have free reign to grow, multiply, and begin devouring native species with nothing to hold them back. The East Coast of the United States is being attacked by one such aquatic invasive species: the European green crab. This little crab is well-known to ecologists here in California – it has also reached the West Coast, but to a lesser extent. The seemingly harmless green crab exists in marine habitats with harmony along the Atlantic coast of Europe and northern Africa; here in the United States it is an insatiable predator that has steadily been eating it’s way through our valuable shellfish. When first introduced to the U.S. over 100 years ago, most likely transported by an unsuspecting Trojan Horse in the shape of a ship, the green crab was not so terribly bad. They invaded – but we were quick to respond with effective management and squelched them before they got out of control. Little pocket populations persist along the West Coast and definitely do our native species no favors, but the green crab has so far been unable to establish a destructive stronghold on our coast. Invasive European green crabs have been found on both the West and East coasts, but is wreaking far more havoc along Atlantic shores. Image courtesy of Marine Invasions Research Lab/SERC. Unfortunately, it seems like times are changing. The population of invasive green crabs has exploded along the coast of Maine and are decimating shellfish populations, a loss that will likely cost the state millions of dollars. The bivalve shellfish industry is Maine’s third most profitable fishery and the green crabs have been gobbling up the “spat”, or juvenile shellfish, like there’s no tomorrow. Efforts to eradicate them have thus far proved fruitless. As fishermen grow more desperate, the crabs are simply growing fatter and multiplying. In some areas, up to 90% of clam flats no longer have any harvestable clams. The devastation wrought by the invasive green crabs will cost fishermen their jobs and could impact the state’s tourism, as Maine is well known for it’s abundant and delicious seafood – which may no longer be available. Coastal embankments are crumbling where the green crabs have been burrowing in their never ending search for food, causing a devastating erosion process. So why has the European green crab suddenly been able to outsmart us to such an extent after more than 200 years in residence? This tremendous explosion in numbers is very likely the result of warming ocean temperatures. The sea surface temperature in the Gulf of Maine reached its highest temperatures in over 150 years during 2012. We’ve known for some time that green crabs have difficulty molting and reproducing in water colder than 10 degrees celsius, which is partly why they have not been able to invade the West Coast as effectively – at least not yet. 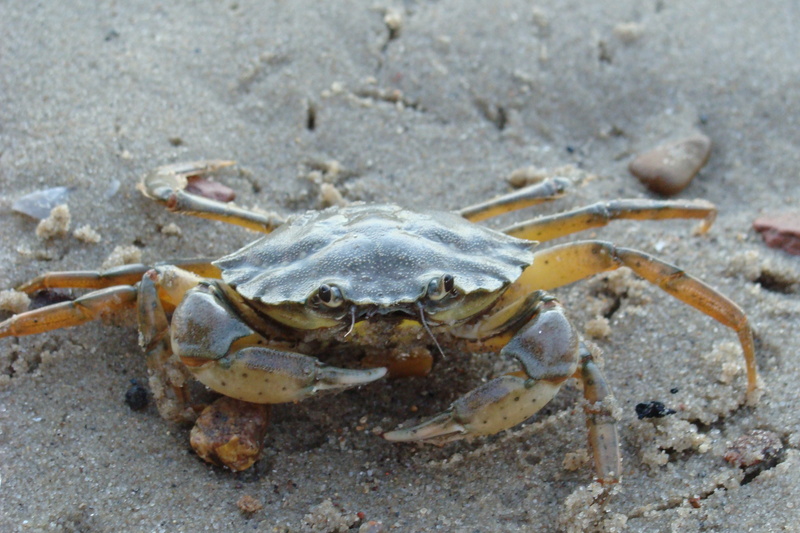 The invasive crabs are well-adapted to warmer temperatures that more closely match their native range. They are able to spread faster and reproduce more quickly, entering areas that before were too cold for them, and increasing their invasive range. Sea surface temperatures in the Gulf of Maine reached the highest on recorded in 150 years in 2012. It is a side effect of climate change that is unprecedented, one that we were not prepared to handle. Warming ocean temperatures can not only make a less favorable habitat for our native species, but it can make conditions more favorable for aquatic invasive species. The green crab has always required little management on both coasts, but with warming temperatures, we have no real management method in place for a booming population of the invasive crabs. Fishermen, regulators, and scientists are scrambling to find a way out of the green crab pickle. There is such a massive number of the green crabs that an effort to catch and eradicate them completely would have to be on a grand scale. There is no established economic market for the crabs – the large ones can provide nutritional food, but most are too small to be eaten. They can be used as compost, but as of now they have little economic value. Gathering all these crabs has proven to be a daunting task, considering the sheer numbers and range. Any type of chemical pesticide would damage non-target native species as well. Of course ocean conservationists and researchers are trying to discover what effect warming ocean temperatures might have in tropical waters. If our cold, resilient east coast has suffered so much from one little invasive crab, what will be the effects of warming ocean temperatures on delicate coral reef ecosystems? As the center of marine biodiversity, South Asia is one very important area of concern when we are considering how warming ocean temperatures will affect coral reefs. Corals are already sensitive to even minuscule temperature changes and have the terrible tendency to bleach when under stress, or expel their zooxanthellae (symbiotic algae that provides food for the coral). If the stressor goes away, the corals are able to resorb zooxanthellae and they will survive. But if the stressor continues long enough – such as a persistently warmer ocean – the corals eventually die. As coral reefs provide for countless coastal communities in South Asia, a warmer ocean could have economically devastating effects. This is yet another downside to the climate change dilemma. What other aquatic invasive species will thrive in the new conditions our oceans are undergoing? How much economic impact will we see in the coming years from the spread of invasives like the green crab? How can we manage to adapt our fisheries management strategies to compensate for the unforeseen effects of climate change? In time, the West Coast could suffer a similar boom in green crabs, bringing habitat and economic damage with it. Our coasts are more nutrient rich than the Atlantic and there is even more potential for native species to fall victim to aquatic invasive species. Hopefully we will learn from the crisis on the other side of the country and investigate what management procedures can be set in place in case something similar happens. Scientists are struggling to understand what changes in the marine ecosystem will be brought on by climate change, but these changes are difficult to predict and it will be even more difficult to implement fisheries management changes on the basis of predictions. This is why it is so important to make the change now. Our carbon emissions are affecting marine ecosystems in complex ways that we are only beginning to understand. The best way to mitigate these effects is by starting at the source and working to reduce our carbon footprint. Each and every person has a part to play, and together we create a brighter future. We urge you to support businesses that strive to keep our oceans healthy, such as Pucci Foods. Categories: global warming | Tags: aquatic invasive species, climate change, coral reefs, fisheries, global warming, oceans, Pucci Foods, seafood | Permalink.